Surat, the second largest city in Gujarat, is famous as an important centre for its business, manufacturing units and educational institutions. One of the major gemstones yielding cities in the world, Surat sees merchants of precious stones from all over. Surat is port city and strategically located on the western banks of river Tapti. Let’s us know more about this fascinating city and its attractions. Surat today, is a an emerging city both culturally and economically. The tourism scenario of the city has also taken a good turn, with the increase in the number of domestic and international tourists. If you’re coming from the national capital, taking a New Delhi to Surat train might be a good idea, as you’d be able to view the magnificent countryside as well. Surat might not be as popular the other top tourist destinations in the country, but still manages to captivate visitors with never-seen-before wonders and its proximity to other attractions in the state. Gir National Park and Rann of Kutch are some of the biggest crowd pullers in its proximity. However, if you really want to experience real Surat, here are few places that you need to visit for sure. Mughal Sarai - Constructed during the rule of Mughal Emperor Shah Jahan, in 17th century, this historical monument is one of the biggest tourist attraction in Surat. ‘Sarai’, which means a resting place for travelers, was one the way the Mughals showed their hospitality. This splendid structure consists of several artistically made patterns, arches and hallways. Today, the monument is an office for one of the government’s department. Sardar Patel Museum - Established in 1890, this is one magnificent place to visit in the city. The museum is a great spot to see and admire the art forms from yesteryears like handicrafts made of terracotta, wood and metal. You could take a tour of more than 1000 hand-made work of art. The museum is added with modern facilities, is open air and can accommodate more than 400 people. Surat Castle - This historical castle, which is also known as Old Fort, was built in the 16th century by a commander in the Mughal army, Khudawand Khan, to block the oncoming of foreign invaders. Situated on the banks of the river Tapti, the castle is famous for its intelligent architecture, and still is in a perfect condition. Your trip of Surat is incomplete without facing this country. 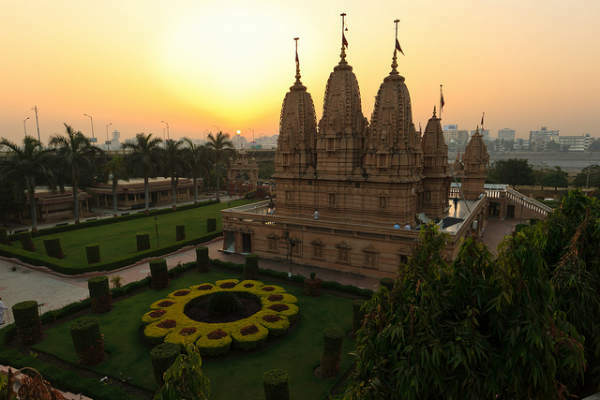 ISKCON Temple - The ISKCON group is known for their huge following and large, beautiful temples, and like every other temple the one in Surat is a magnificent home of art and devotion. This prestigious temple attracts pilgrims and devotees from all over Gujarat and the western region. Away from the chaos of the city, the temple offer a peaceful environment, perfect for taking a breather in your tour. Suvali Beach - At about 20 km from the city, lies a popular tourist attraction known as the Suvali beach. The stretches of black sand is perfect for long morning and evening strolls. When you’re done visiting the attractions of the city, bring a hammock or a foldable bed and enjoy the serene surrounding. So, if you’re planning to enjoy the inexpensive wonders of Surat, makes sure you visit these places for sure.